Studying historical combat techniques with heavy weapons is rewarding and fun, but, like most other martial arts, inherently risky. We all have proper jobs to go back to, families to look after, bills to pay; things that are difficult enough without the added burden of trips to A&E, bandages, splints, crutches and the long-lasting effects of concussion (genuinely no laughing matter). We are not 24/7 Medieval or Renaissance warriors. This is a hobby more than a lifestyle choice. The Living History folks seem to draw the line at period dentistry and avoid like the plague period diseases like, err, the plague. There is no added glory in testosterone-fulled antics of Frat-house initiations or Jackass TV pranks designed to maximise the chances of a ride home in an ambulance. Or a hearse. ‘He who lives to fight another day…’ is probably onto something. And personally, I’m just not that into pain. So just how safe is HEMA, how safe should it be, and how safe can we make it? HEMA is a martial art; a physical activity demanding repeated practice and implementation of historically accurate levels of horrific violence. This does not make it any less safe than karate, kali, or krav maga. 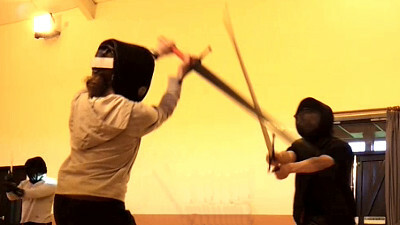 In fact, a heightened awareness of the effectiveness of certain techniques and the potential of injury makes HEMA a highly risk-aware activity. We often quote the statistics that sports fencing is safer than golf – falls, heart attacks, muscle tears and buggy accidents – and I’d venture that HEMA is safer than either. How do we make it so? 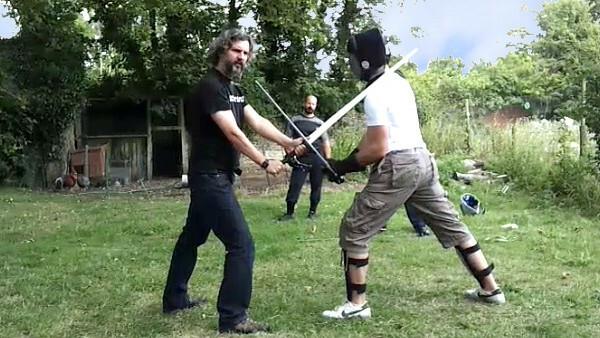 There are two modes in HEMA – training and sparring. Training in class is, in theory, the most safe. At low intensity and low speed, training concentrates on form and technique. Low- or non-contact training, slow-motion exercises and a deliberate focus on NOT hitting your training partner should make this as safe as, say, ball-room dancing. Sparring is what we call actual bouts; high-intensity at full speed with the intent to hit – but not injure – your sparring partner. Theoretically then, we require at least two levels of protective gear for training and sparring. For training, you could get by with no protective kit at all – for low intensity and slow speed practice drills, nobdy need get hit, certainly not with any force. However, Murphy’s Law tends to kick in whenever two humans interact; HEMA is never a perfectly synchronised dance of polished professionals. When you’re practising techniques and one or other training partner is ahead or behind the other in experience or comprehension, that’s when accidents happen. It’s a common misconception that metal weapons must be more dangerous because they are, well, metal. However, the nylon training wasters can weigh more than the metal counterpart, and with the mass of the thicker plastic blades, can travel faster, and with more momentum than metal. So it is possible to cause as many or more injuries with nylon wasters as with metal weapons, and while you may not get the concentrated impact of a blunted metal edge, the nylons can cause as much or more blunt-force trauma. Experience teaches that HEMA training without any kit is a bad idea; there comes a stage, in all but the slowest, controlled drills, where actually a fencing mask and a decent pair of padded or armoured gloves is a good and sensible precaution. Step up the intensity just a little and the possibility of repeated cuts and thrusts to the chest make a gambeson or padded jacket not only desirable but almost essential. Add the demands of particular weapons or techniques involving specific strikes and counters, and full protection becomes essential, up to and including throat, chest, arm and leg protectors. You will see videos online of training sessions with practitioners in just masks and t-shirts. I call these people bonkers, irresponsible, or just plain lucky not to have taken a serious injury yet. It only took one good hit on my boney physique from a hazel single-stick to realise I don’t have enough natural padding. My left elbow has never been the same since. I maintain it doesn’t matter how good you are, how well-drilled, practiced and familiar with both techniques and partners, at some point you will take a whack from a weapon, a foot, a fist or an elbow, when you will be mightily glad of the kit you put on, or rueing the kit you didn’t. Sparring steps up the intensity to a whole other level, even to the closet thing to real combat one can experience without resort to sharp weapons. This is ‘real’ fighting but still tightly controlled and regulated. Even with wrestling and pugilism allowed, HEMA sparring is not a ‘no holds barred’ activity – otherwise we’d soon run out of opponents or find ourselves in hospital. Medieval and Renaissance techniques are as brutal as any contemporary military fighting systems. See the illustrations in the original treatises. In sparring you are deliberately trying to hit each other; not with malicious intent, or necessarily hard; it is a contest of skills not strength and brutality (although HEMA competitions can be another thing entirely). You both want to feel safe in the knowledge you can hit and be hit, then everyone walks away smiling. That means having the appropriate level of protective kit for the weapon, the exercise and the intensity of the session – be it selective practice or free-play. Moreover, every participant needs to feel comfortable with the level of risk involved at any stage, and comfortable with a level of protective kit to mitigate that risk. They need to know that everyone respects their choice of the level and type of gear being worn, without fear of mockery. Again, no extra points for testosterone-fulled, alpha-male B-S. They should also be prepared to don more kit than personally preferred, at the request of instructors or other participants. Don’t make other people culpable in your own level of reckless irresponsibility if you choose NOT to get kitted up for drills or sparring. 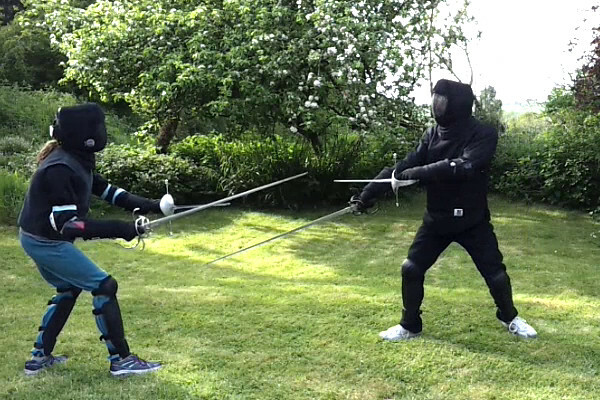 There’s a time for gambling with one’s personal safety and well-being; I’d suggest the HEMA session is not it. Respect is the key word. Respect the weapon; respect the techniques; respect the instructor and your training partners. Do compromise if everyone wants to kit up more fully than you; don’t compromise if a room full of idiots decide not to kit up when you know better. Being comfortable does not mean wearing a t-shirt in preference to a hot sweaty mask and jacket. It does mean feeling confident that the amount of kit everyone is wearing will minimise any injuries given or sustained. HEMA may not be risk-free, but it is not inherently unsafe, except in the way it is practiced. Be safe. Enjoy.